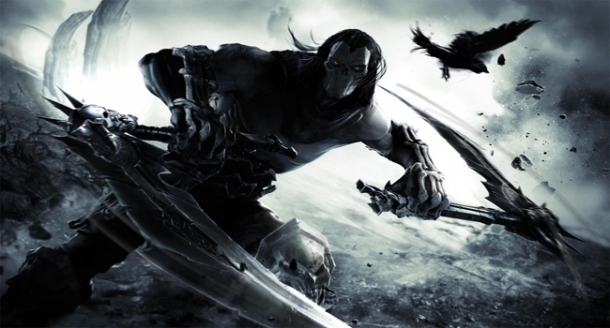 In Darksiders II, the player controls Death, one of the Four Horsemen of the Apocalypse. The core gameplay is that of a third-person hack and slash action-adventure with role-playing elements. It takes bits of gameplay from other games and franchises, such as Prince of Persia and Devil May Cry. The game consists of main story missions, but also features side quests that can be accepted and completed at the players convenience. In the upper left corner of the screen, multiple meters track Death's Health, Wrath, Reaper energy, and experience. Despite having a health meter, Death can not die and will respawn at the last checkpoint. In order to heal you will either need to use Potions or level up, regaining your full health in the process. Note that Death can carry a maximum of 5 potions at a time. Wrath energy is Darksider's mana system. Gained over the course of battles, the energy can be used for special abilities in combat to ease the battles. Reaper energy is a separate form of energy that is gathered through combat and acts similar to Dante's Devil Trigger in Devil May Cry, transforming Death into his grim reaper form and making him more resilient to attacks and stronger. As Death defeats enemies and completes quest he will gain experience. When he gains enough experience, Death will Level Up and gain a Skill Point. While most of the character movements are standard, such as climbing and jumping, there are additional new features that aid Death in proceeding through areas. A mechanic ripped straight from Prince of Persia, Death can wall run along any smooth wall by angling toward a wall and run / jumping onto it. This allows you to traverse small gaps to reach other ledges, vines, etc. If Death finds himself wall running into a dead end, he can jump to the adjacent wall, across the corner, to continue his run on the other side. Sometimes Death may find himself needing to ascend with seemingly no way up. In these cases, often two smooth vertical (or horizontal if you are crossing a large gap) walls will be close enough together that he can jump back and forth between them until he reaches his destination. As the player kills enemies and opens chests, they will find new equipment that can be equipped via the inventory. This equipment can be anything from a secondary weapon to armor. Additionally, special Possessed Weapons are rarely acquired, which can be upgraded by trading in unwanted items. 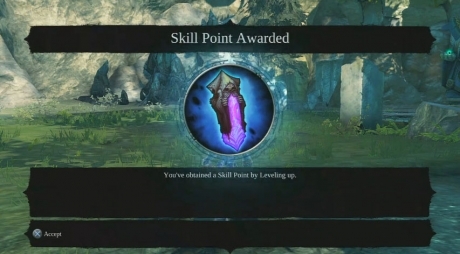 As Death defeats enemies, break pots, and sells old equipment he will obtain Gilt, which can then be used to "Train" and learn new skills or buy other equipment. Boatman Coins - glowing green coins that can be used to buy boxes from Vulgrim that grant random items. Stonebites - blue stones hidden throughout the world which can be traded to the character Blackroot, in groups of three, in exchange for various permanent statistic upgrades.